Barracuda Studios is proud to announce 2 new sets in the popular and fast growing 1/32nd scale. The Trumpeter Me-262 is a very nice and well reviewed kit. 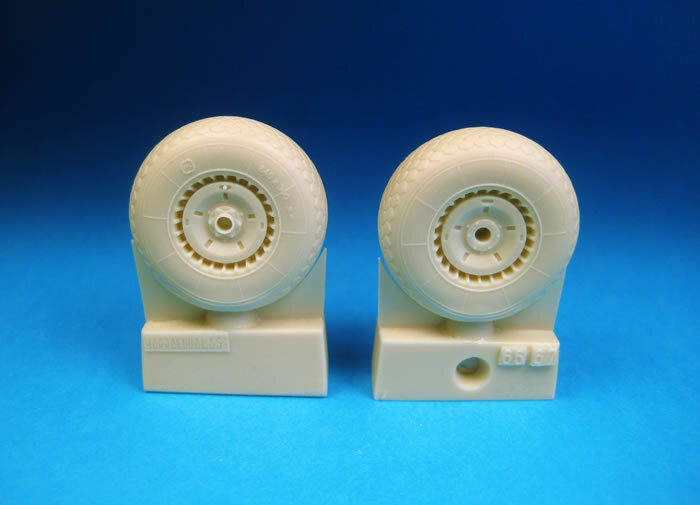 As with most of their 32nd scale aircraft models, the tires are supplied in vinyl, making cleanup and painting problematic. These new tires are far from resin copies of the kit wheels. These are all new, designed from scratch based on close study of actual surviving original wheels and tires. Even the tread pattern on the mainwheel is painstakingly recreated, down to the center row of tread blocks that are narrower than all the others. Raised tire beads and tire size data are beautifully molded. We think these are the best 262 wheels ever done, but... we might be a little lacking in objectivity! We'll leave that decision up to you. 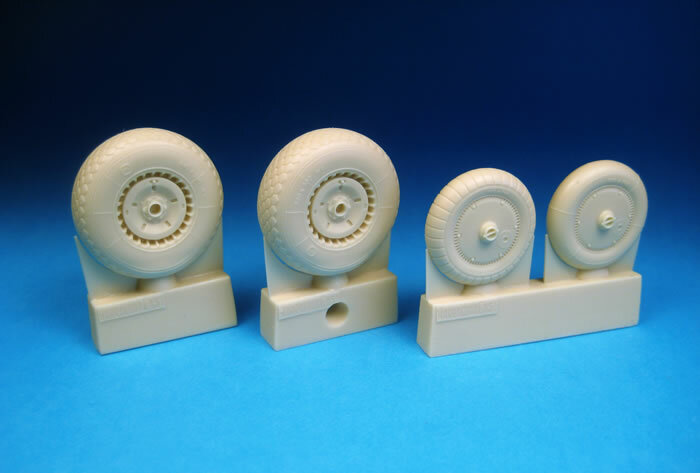 This set consists of detailed, accurate resin cast mainwheels with exacting tread pattern and a choice of two styles of ribbed hub nosewheel. The nosewheel tire patterns included are smooth and ribbed. 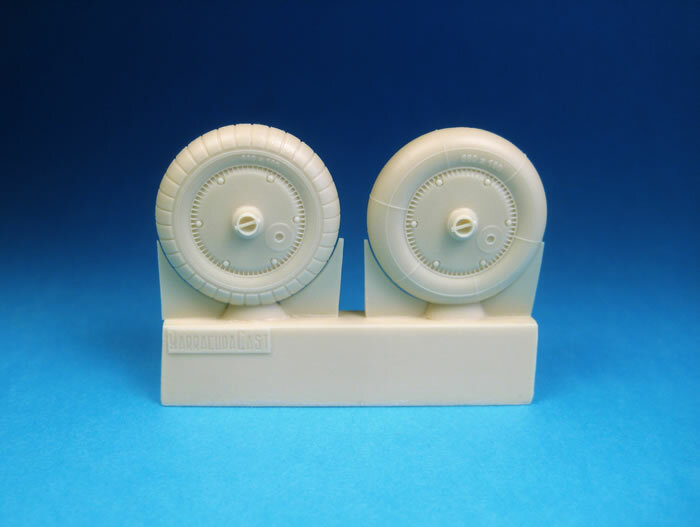 The mainwheels are molded without the brake lines, which are added by the modeler from the included wire and pressure couplings. Complete, illustrated instructions in color detail the easy to install brake line procedure, which will yield a much more realistic look than if they were molded in. These wheels are designed to replace the vinyl/plastic kit tires in the Trumpeter kit, but will greatly improve both the Hasegawa and Revell offerings as well. 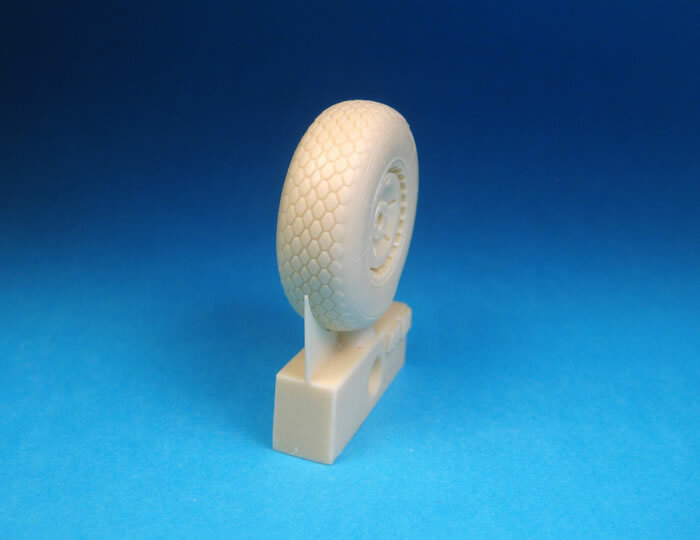 This set consists of detailed, accurate resin cast mainwheels with exacting tread pattern and a choice of two styles of smooth hub nosewheel. The nosewheel tire patterns included are smooth and ribbed. 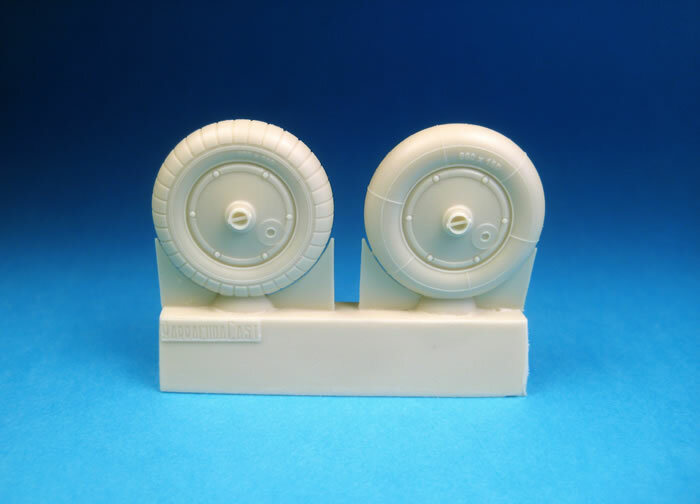 The mainwheels are molded without the brake lines, which are added by the modeler from the included wire and pressure couplings. Complete, illustrated instructions in color detail the easy to install brake line procedure, which will yield a much more realistic look than if they were molded in. These wheels are designed to replace the vinyl/plastic kit tires in the Trumpeter kit, but will greatly improve both the Hasegawa and Revell offerings as well. In other BarracudaNews, the reprinted Mustang decal sets in 32nd and 72nd are due early next week. The Mustang cockpit stencils and placards are also due back in stock next week. More new resin is coming very soon. watch this space for announcements.